Last month, Charles was invited to be a panelist at the 10th Annual Architecture Series by the Aspen Museum. Shortly after, Senior Architect Jim Kehoe was asked to present at the ‘2018 PechaKucha: A Discussion for Emerging Voices,’ an annual series by the museum where architects and designers present new practices to the local community. 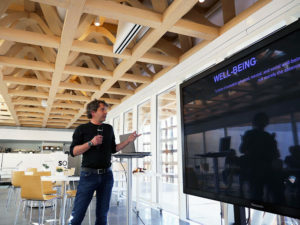 Jim covered a topic he is familiar with, the intersection of well-being and architecture, highlighting the ways that design can reduce stress and enhance happiness. Sighting recent CCA projects in Telluride, CO and Phoenix, AZ, Jim shared design techniques such as raised windows to maximize light and proximity to nature, all which have positive effects on executive functions of the brain. Alongside Jim, panelists included Ashley Clark, Alex Klumb, Lea Sisson, Will Young. To read more about PechaKucha, click here. To view the entire lecture on Facebook, click here. This entry was posted in Featured, Industry News and tagged Architecture lecture, Aspen, Aspen architect, Aspen Art Museum, co, Colorado architect, Jim Kehoe, PechaKucha, phoenix, Telluride. Bookmark the permalink.